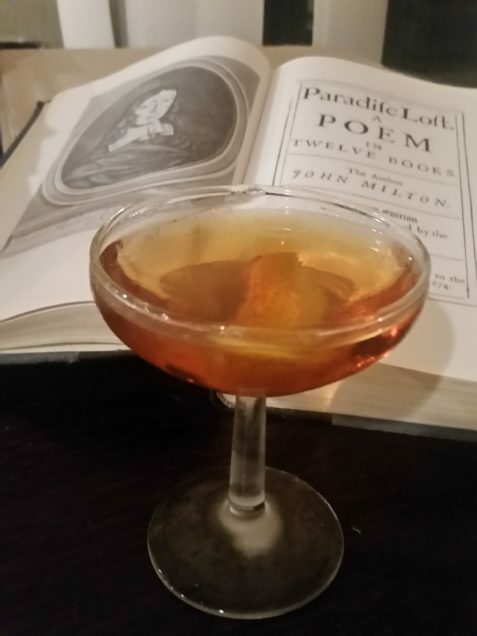 Today’s drink is a little known beverage I dug up in Gary Regan’s classic “The Joy of Mixology.” It’s terrifying name notwithstanding, the Deadly Sin is basically just a supercharged variation on a Manhattan. It’s not for everyone, but I think it’s a pretty good choice if you’re in need of a serious attitude adjustment and don’t want to mess around too much with a lot of ingredients. Indeed, the most difficult thing about this drink is some sightly odd measurements. However, I wouldn’t try messing with them much. I did and the result was nasty as sin, but not a particularly deadly one. Combine all the liquid ingredients in a cocktail shaker or mixing glass. Stir vigorously and strain into a chilled cocktail glass. Sip and contemplate how many of your sins are really deadly, and the whether the worst ones are the things you did, or the things you didn’t do. This is a drink for people who like their booze to be booze. There’s no real way to soften it. I tried bumping up the the vermouth and maraschino to half an ounce each and, as I alluded to above, it was something I’d counsel you to avoid. It wasn’t just too sweet, it was kind of grossly misjudged. Also, this one is a “stir” not a “shake” in my opinion. Adding extra ice to the cocktail only seemed to reduce the more pleasant flavors. On the other hand, I think there is room to play around with the brands of your ingredients. I had the best results using Clear Creek Bourbon, Carpano Antica vermouth, and Maraska maraschino. However, obviously the bourbon really dominates this drink so my results weren’t all that much different when I used Martini vermouth and Luxardo maraschino. On the other hand, none of these brands were really able to tame Wild Turkey 101 Bourbon, but I guess that’s what makes it wild. Considering we’re talking about the Deadly Sin, I suppose I should not be surprised!